This girl can't even afford a meal and is now suffering from cancer. 15 Year old Sahiba, Since November 2016 has been diagnosed with cancer and renal failure. She was initially diagnosed of the disease at Tata Memorial Hospital Mumbai and is now getting treated at CHL Hospital Indore. The family has struggled to arrange even 1.5 lakhs for her initial treatment and now require close 5 lakhs to ensure she gets fully cured. The family financial condition is extremely poor and they cannot even afford a meal twice a day. 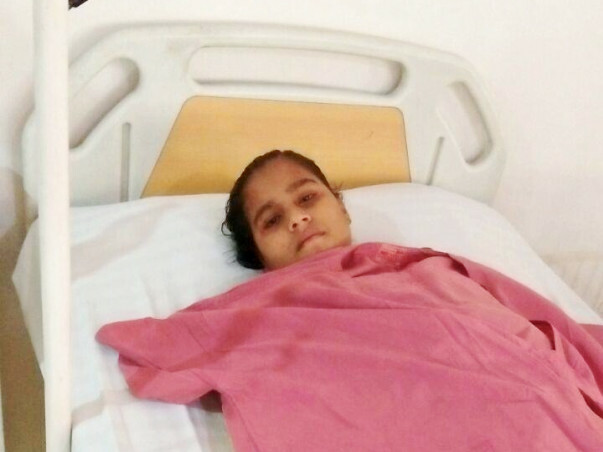 Request you all to please come forward to support of Sahiba's treatment. Sahiba started to rapidly loose weight and used to look severely dehydrated. It all started in September 2016. 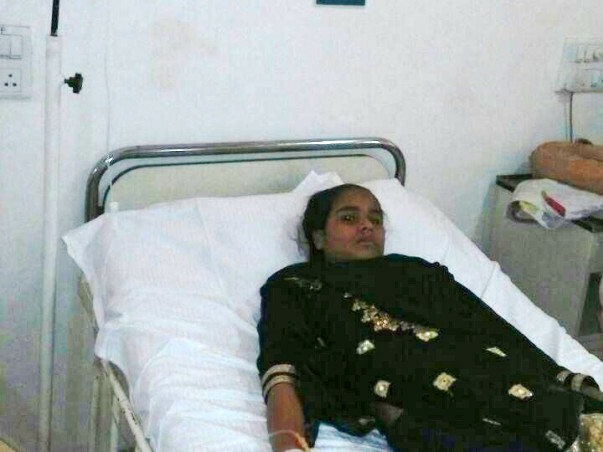 Sahiba developed a very high fever which continued for days because of which she started to lose weight, looked dehydrated and her eyes seemed to be popping out. The family hails from a small village in Madhya Pradesh, Khategaon in a rural district of Dewas. The doctors in the village were unable to diagnose what is wrong with the poor girl. 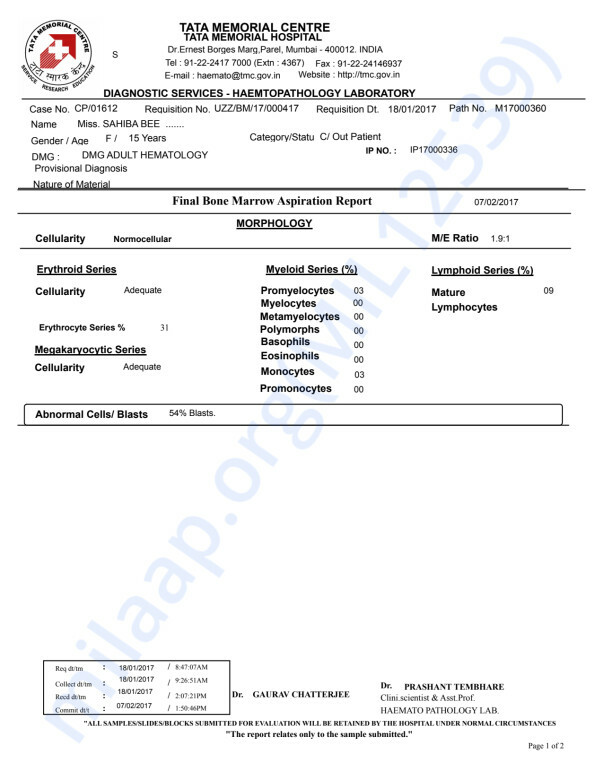 The parents got extremely worried and they visited various hospitals in Indore but nobody was able to diagnose the problem. After three months of hardship, they finally reached TATA hospital in Mumbai with the help of their relatives. The hospital started doing tests and gave the shocking news to the parents that Sahiba is suffering from Acute Lymphoblastic Leukemia (Blood Cancer) & Renal Failure. Acute Lymphoblastic Leukemia is a rare type of Blood Cancer which if treated properly can be cured in 80% of the patients. However, this comes with the background that Sahiba's parents are financially weak and not so literate. 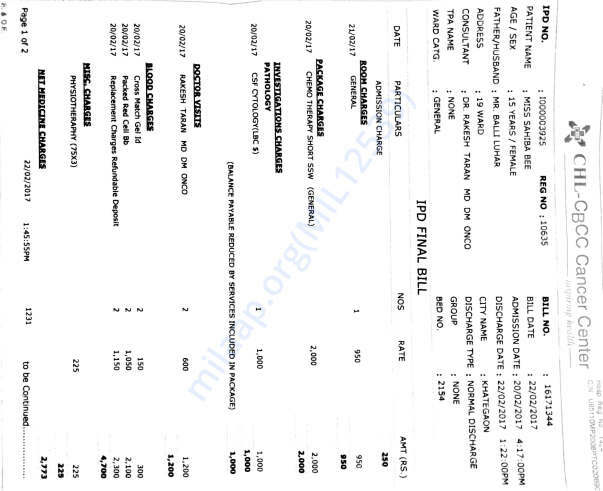 With government help and local help the family has spent almost Rs 1,50,000/- for initial treatment. They have brought her to CHL -CBCC Cancer Centre, Indore under Dr Vinay Bohara's care and she is responding well to the initial treatment. The life of Sahiba's father has always been a struggle. He earns Rs 7000/- per month by doing labour work which is not sufficient for the survival with min resources & family is staying in a rented house which makes there life more difficult. Her mother father cannot even afford food for the entire day. Though she is responding well to treatment, her parents and relatives have exhausted all their money on Sahiba's treatment & now it is at the risk of being stopped. This will badly affect the chances of her being cured. Her parent has begun to cry and is in such a bad condition that some time they have to even beg to get some food during the day. They know their child can be cured but have no means to make it happen. They have already contacted their relatives, friends and other known people for financial help but has not received any help. 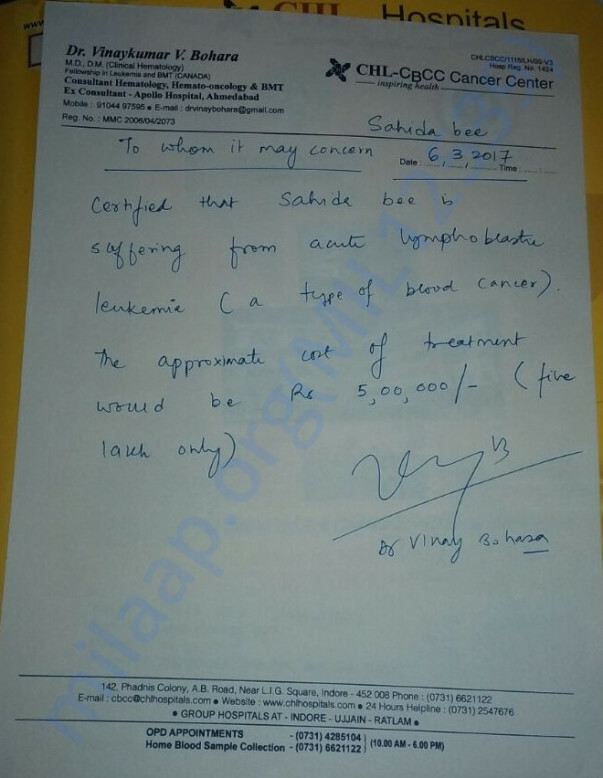 Sahiba still requires another 5 lakh for the treatment. With you support Sahiba can fight this and grow up healthy. Dr Vinay says that if Sahiba continues her treatment to which she has been responding well there is an extremely good chance for her getting cured and growing up to have a normal and healthy life. 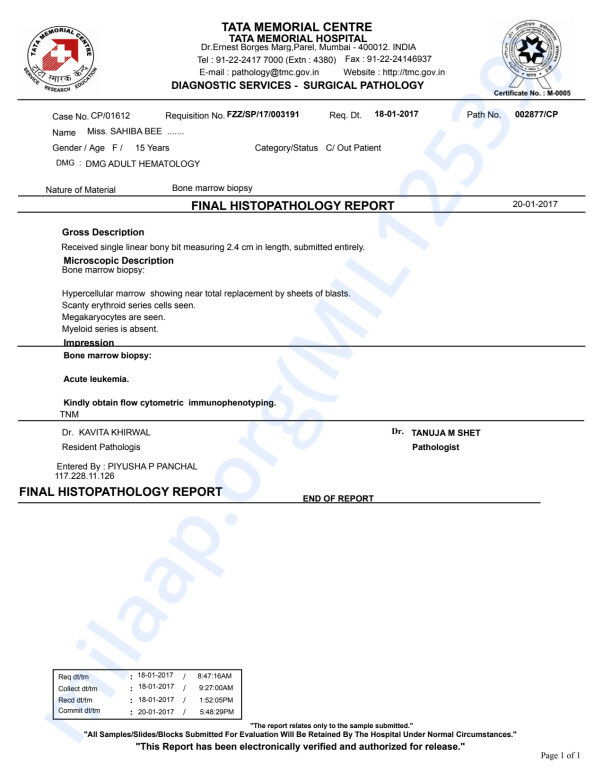 She currently needs 5-6 months of treatment consisting of light chemotherapy sessions. 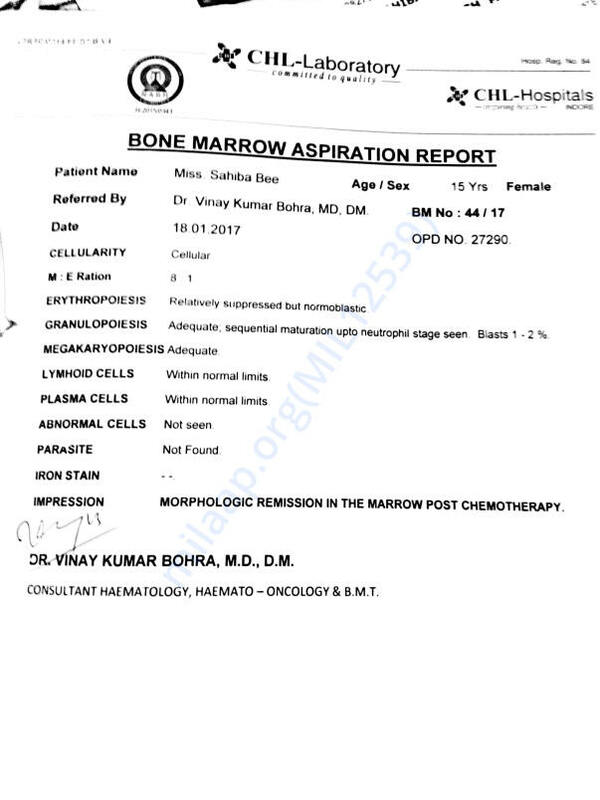 A Bone Marrow Transplant would be required only if, she stops responding to the current treatment. Even a temporary relief for Sahiba's treatment, brings a smile on her parents face but her treatment may stop because of lack of money which keeps her parents worried. Their condition is so poor that they cannot even afford food. With your support and contribution, this girls treatment will continue and her parents will get a chance to see her grow up healthy. 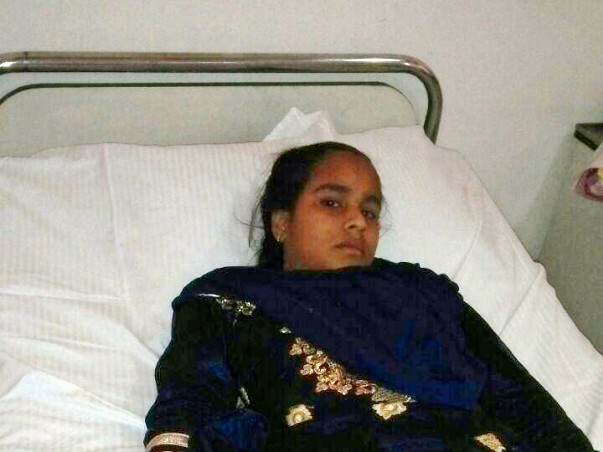 Thanks to All Supporters to help sahiba's treatment. Since sahiba getting treatment in CHL Hospitla Indore. Thanks Thanks Thanks to All. Hello friends thanks to all. 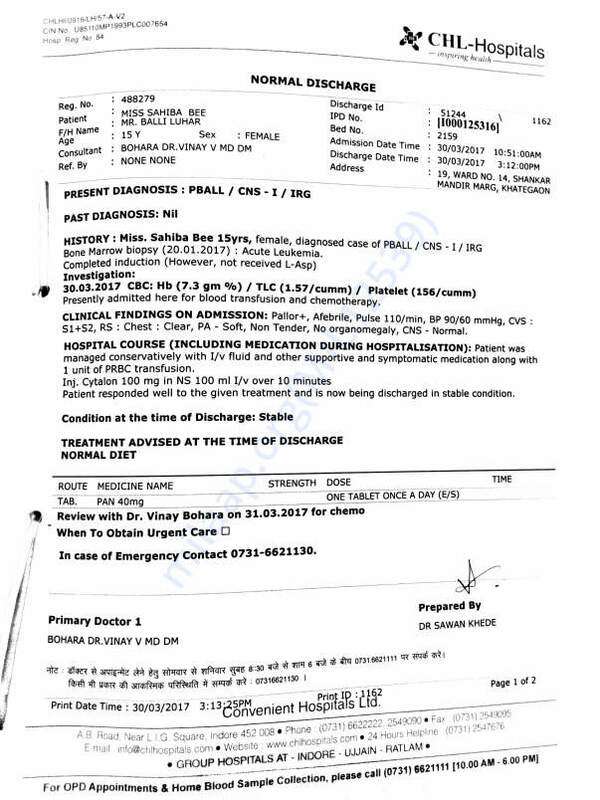 It is informed that sahiba's health condition is better. Light chemo session is completed and dr say's we are goring to right way . 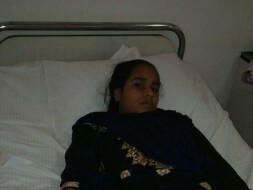 It is also requested that please support finance to sahiba for her life.